We commonly get questions about total hip replacement surgery in dogs. Here are the most common questions answered. What size and age must a dog be in order to be considered for total hip replacement? Since the introduction of the micro and nano total hip replacement systems (Figure 1) we can now perform this surgery in dogs and cats as small as ~ 4 kg and there is no upper body size limit. Figure 1. 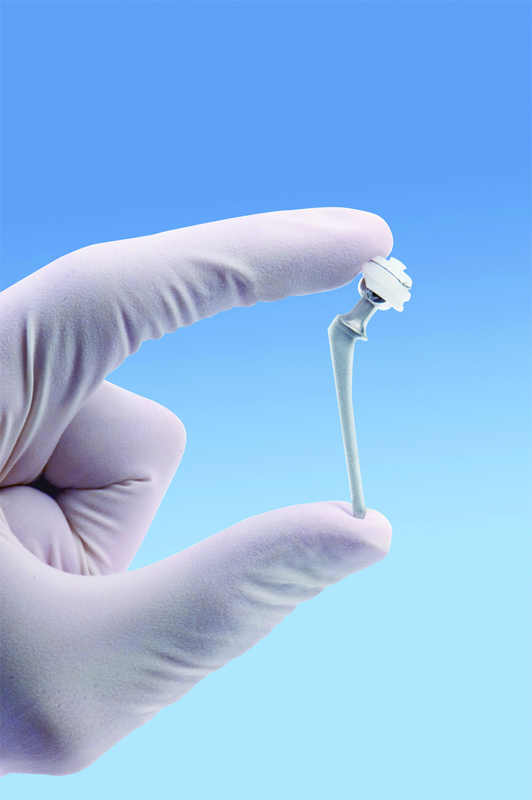 Nano femoral stem and cup implants. Figure 2. VD pelvic radiograph revealing a fractured left capital physis and caudal acetabulum (white arrow). 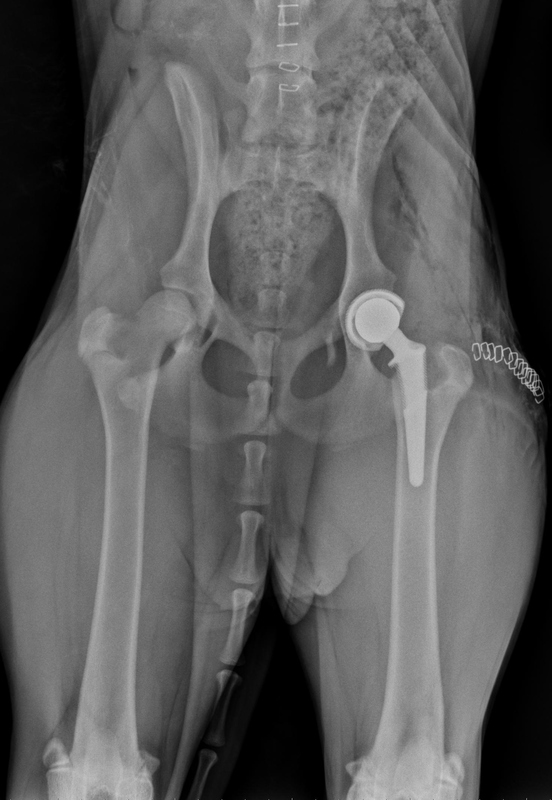 The acetabular fracture precluded typical physeal repair so we counseled the owners that a total hip replacement was the best option for this large and still growing dog. (Figure 3) Obviously, waiting until “Harry” was more mature was not an acceptable option. Figure 3. Postoperative VD Pelvic radiograph following cementless left total hip replacement. Since canine hip dysplasia is typically bilateral, how often do dogs need to have both their joints replaced? Only 20% of dogs that have bilateral hip disease require both joints to be replaced in their lifetime. Since dogs bear most of their body weight on their forelimbs, replacing one hip allows them to better distribute the load off the remaining “bad” hip to the other limbs. 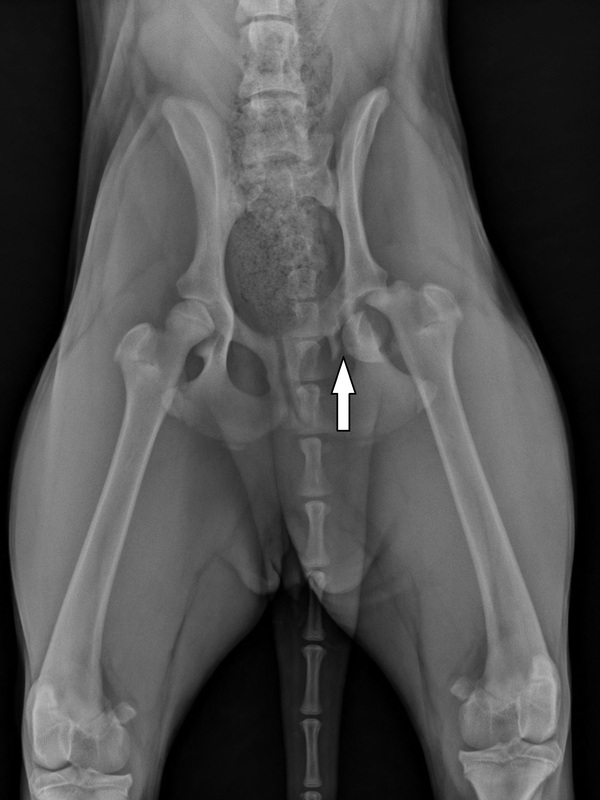 It’s not possible to consistently predict which dogs will require both hips to be replaced. As such, we replace the more clinically affected one and then gauge how the dog responds. If indicated for the unoperated hip, multimodal management of osteoarthritis can include the use of chondroprotective agents and analgesics. How long does a total hip replacement “last”? Our expectation is that the replaced hip will remain stable and functional for the pet’s entire lifespan regardless of at what age they are implanted. The need for total hip replacement revision surgery due to implant wear is rare in veterinary medicine. This is because of the limited longevity of our patients when compared to humans. Additionally, as quadrupeds, the weight distribution across their hip joints is more “forgiving” than that for bipeds.